Gold discoveries in Colorado began around Denver; prospectors traced the placer gold to its source in the mountains west of Denver, then followed the Colorado Mineral Belt in a southwest direction across the state to its terminus in the San Juan Mountains. The Cripple Creek district, far from the mineral belt, was one of the last gold districts to be discovered and is still in production. Ralston Creek (center of picture) at its confluence with Clear Creek in Arvada. A gold discovery in 1858 in the vicinity of present-day Denver sparked the Pike's Peak Gold Rush. In 1858, prospectors focused on the placers east of the mountains in the sands of Cherry Creek, Clear Creek, and the South Platte River. However, the placer deposits on the plains were small, and when the first rich discoveries were made in early 1859 in the mountains farther west, the miners abandoned the placers around Denver. 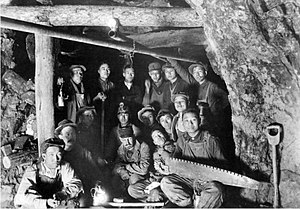 Chinese-American miners in the Colorado School of Mines' Edgar Experimental Mine near Idaho Springs, circa 1920. In May 1859, John H. Gregory found a gold-bearing vein (the Gregory Lode) in Gregory Gulch between Black Hawk and Central City. Within two months, many other veins were discovered, including the Bates, Gunnell, Kansas, and Burroughs. Other early mining towns in the district included Nevadaville and Russell Gulch. The early gold discoveries were at the northeast end of the Colorado Mineral Belt, a large alignment of mineral deposits that stretches northeast-southwest across the mountainous part of Colorado. From Idaho Springs, prospectors followed the Colorado Mineral Belt west along Clear Creek, then over the mountain passes to South Park and to the headwaters of the Blue River. Remains of the Swan River gold dredge, 2007. The gold mines around Breckenridge are all shut down, although some are open to tourist visits. The characteristic gravel ridges left by the gold dredges can still be seen along the Blue River and Snake River, and the remains of a dredge are still afloat in a pond off the Swan River. The Cripple Creek mining district covers a Miocene volcanic caldera filled with quartz latite porphyry. The ore bodies are veins and replacement zones within the quartz latite. The ore minerals are gold and silver tellurides, with accessory fluorite. ^ a b A. H. Koschman and M. H. Bergendahl (1968) Principal gold-Producing Districts of the United States, US Geological Survey, Professional Paper 610, p.143. ^ Ben H. Parker Jr., Gold placers of Colorado, book 1, Quarterly of the Colorado School of Mines, v.69, n.3, July 1974, p.26. ^ Robert L. Brown (1985) The Great Pikes Peak Gold Rush, Caldwell, Ida. : Caxton, p.26-32. ^ Paul K. Sims and others (1963) Economic Geology of the Central City District, Gilpin County, Colorado, US Geological Survey, Professional Paper 359, p.7-8. ^ A. H. Koschman and M. H. Bergendahl (1968) Principal Gold-Producing Districts of the United States, US Geological Survey, Professional Paper 610, p.86. ^ A. H. Koschman and M. H. Bergendahl (1968) Principal Gold-Producing Districts of the United States. US Geological Survey, Professional Paper 610, p.116-117. ^ A. H. Koschman and M. H. Bergendahl (1968) Principal Gold-Producing Districts of the United States, US Geological Survey, Professional Paper 610, p.109-110. ^ Ben H. Parker Jr., Gold Placers of Colorado, Book 2, Colorado School of Mines Quarterly, Oct. 1974, v.69 n.4 p.17. ^ Mark W. Davis and Randall K. Streufert (1990) Gold Occurrences of Colorado, Colorado Geological Survey, Resource Series 28, p.54-55. ^ Bruce Geller, Summitville, Colorado, Mining Record, 25 Feb. 1987, p.17. ^ a b c Mark W. Davis and Randall K. Streufert, 1990, Gold Occurrences of Colorado, Colorado Geological Survey, Resource Series 28, p.28. ^ Al Knight, ‘Disaster’ at Summitville was after the EPA arrived, Denver Post, 28 Apr. 1996, p.1E. ^ Environmental Considerations of Abandoned Mine Lands (1995) US Geological Survey, Bulletin 2220. ^ Mike McPheee and Mark Eddy, Ex-mine managers sentenced, Denver Post, 19 Dec. 1998, p.4B. ^ J. E. Murphy, Tunnel Unwaters Famous Gold District, Popular Mechanics, Vol. 32, No. 5 (Nov. 1919); pages 742-743. ^ Keith Dyas and Jerry Marcus (1998) The Cresson project, Engineering & Mining Jour., 6/1998, p.32KK-32OO. ^ a b "2017 Annual Report and Form 10-K" (pdf). Greenwood Village, Colorado: Newmont Mining Corporation. 22 February 2018. p. 31. Retrieved 24 May 2018.